Formed after WW2, Nedlloyd Lines was initially a partnership of several Dutch shipping companies, comprising among others Nederland Line, Royal Rotterdam Lloyd and VNS - United Netherlands Navigation Co.. In 1970, those companies were merged, together with KJCPL - Royal Interocean Lines (which continued operating under its own name for a while) and later also KNSM - Royal Netherlands Steamship Co. The holding company became Koninklijke Scheepvaart Unie (from 1977 Koninklijke Nedlloyd Groep), but traded as Nedlloyd Lines. Another merger of Nedlloyd and P&O Containers created P&O Nedlloyd in 1996, which in turn was acquired by A.P. Moller-Maersk Group of Denmark in 2005 and merged with Maersk Sealand to become simply Maersk Line in 2006 - the world's largest container shipping company. 1) Amsterdam or Rotterdam, Marseilles, Genoa, Port Said, Penang, Port Swettenham, Singapore, Bangkok, Hong Kong, China (Shanghai?). Return voyages: China, Philippines, Singapore, Port Swettenham, Penang, Aden (optional), Djibouti, Aqaba, Port Said, Tripoli (Libya), Genoa, Marseilles, Antwerp, Amsterdam/Rotterdam. 2) Rotterdam, Port Said, Singapore, Hong Kong, Manila, Japan (Kobe, Nagoya and/or Yokohama). Return voyages: Japan, Hong Kong, Aden (optional), Djibouti, Aqaba, Port Said, Tripoli (Libya), Genoa, Marseilles, Antwerp, Amsterdam/Rotterdam. 1) Amsterdam or Rotterdam, Port Said, Djibouti, Aden (optional), Penang, Port Swettenham, Bangkok, Hong Kong, China (Shanghai?). Return voyages: China, Hong Kong, Singapore, Port Swettenham, Penang, Aden (optional), Port Said, Beirut, Genoa, Barcelona, Amsterdam/Rotterdam. 2) Rotterdam, Port Said, Djibouti, Aden (optional), Singapore, Hong Kong, Manila, Keelung, Japan (Kobe, Nagoya and/or Yokohama). Return voyages: Japan, Hong Kong, Port Swettenham, Penang, Aden (optional), Djibouti, Port Said, Beirut, Barcelona, Antwerp, Amsterdam/Rotterdam. 3) Amsterdam or Rotterdam, Marseilles, Genoa, Port Said, Penang, Port Swettenham, Singapore, Bangkok, Manila. Return voyages: Philippines, Tg. Mani, Singapore, Port Swettenham, Penang, Colombo (optional), Aden (optional), Djibouti, Aqaba, Port Said, Genoa, Marseilles, Barcelona, Bilbao, Amsterdam/Rotterdam. 4) Amsterdam, London, Marseilles, Genoa, Red Sea ports, Djibouti, Aden (optional), North Borneo (Labuan, Jesselton and/or Sandakan), Port Moresby, Honiara, Rabaul. Return voyages: Australian New Guinea (Lae, Madang, Alexishafen and/or Wewak), West Irian (Sukarnapura, Biak, Manokwari and/or Sorong), Tg. Mani, Bangkok, Singapore, Aden (optional), Djibouti, Port Said, Amsterdam/ Rotterdam. Singapore, Hong Kong, Keelung, Japan (main ports), Manzanillo, Acapulco (optional), San José, Acajutla, Amapala, Puntarenas, Balboa or Cristobal, Fortaleza (optional), Recife (optional), Salvador, Rio de Janeiro. Return: Santos, Paranagua (optional), Rio Grande (optional), Montevideo, Buenos Aires, Durban, Singapore, Hong Kong, Keelung, Japan. Japan, Keelung, Hong Kong, Singapore, Port Kelang/Penang (optional), Durban, Port Elizabeth, Santos, Rio de Janeiro. Return: Santos, Paranagua, Rio Grande (optional), Montevideo, Buenos Aires, Cape Town, Port Elizabeth, Durban, Hong Kong, Japan. Hong Kong, Keelung, Japan (main ports), Manzanillo, Acapulco, Acajutla, Puntarenas, Balboa or Cristobal, Manta or Guayaquil, Callao, Matarani. Arica, Iquique, Antofagasta, Valparaiso, Singapore. Japan, Keelung, Hong Kong, Singapore (optional), Port Kelang/Penang (optional), Durban, East London, Port Elizabeth. Return: Cape Town, Durban, Maputo (optional), Singapore, Hong Kong, Keelung, Busan (optional), Japan. Japan, Keelung, Hong Kong, Singapore, Cape Town, Matadi, Douala, Lomé (alt: Cape Town, Apapa, Lomé), Tema/Takoradi, Abidjan, Monrovia, Freetown, Banjul (optional), Dakar (optional). Return: Ports in Freetown/Pointe Noire range (optional), Walvis Bay (optional), Cape Town, Singapore (optional), Hong Kong (optional), Keelung (optional), Japan. Shanghai, Hong Kong, Singapore (optional), Pointe Noire, Douala, Cotonou, Lomé, Tema, Abidjan, Monrovia, Freetown, Banjul (optional), Dakar. Return: Ports in Freetown/Pointe Noire range (optional), Walvis Bay (optional), Cape Town, Singapore (optional), Hong Kong, Shanghai. 1) Japan, Keelung, Hong Kong, Singapore, Port Kelang/Belawan (optional), Colombo, Mahé, Mombasa, Tanga, Nacala/Beira, Durban, Singapore, Bangkok, Hong Kong, Japan. 2) Japan, Keelung, Hong Kong, Singapore, Port Kelang/Belawan (optional), Mauritius, Mombasa, Dar-es-Salaam, Singapore, Hong Kong, Japan. Cochin, Sri Lanka, Singapore, Brisbane (optional), Sydney, Melbourne. Return: Melbourne, Adelaide (optional), Fremantle (optional), Colombo, Cochin. Bombay, Cochin, Sri Lanka, Brisbane (optional), Sydney, Melbourne. Return: Melbourne, Adelaide, Fremantle, Colombo, Bombay. Jakarta, Port Kelang, Bangkok, Singapore, Fiji, Napier (optional), Auckland. Return: Auckland, Tauranga, Jakarta, (Port Kelang), (Bangkok), (Singapore). Jakarta, Port Kelang, Singapore, Lyttelton, Wellington, Auckland. Return: (Wellington), Auckland, Tauranga, Jakarta, (Port Kelang), (Singapore). Durban, Tanga, Mombasa, Portland, Melbourne/Sydney (optional), Dunedin, Lyttelton, Auckland. Return: (Dunedin), (Lyttelton), Auckland, Tauranga, Mauritius, Durban, (Maputo) (optional), (Beira) (optional), (Tanga), (Mombasa). Manila, Keelung, Kaohsiung, Hong Kong, Fiji, Auckland, Wellington, Lyttelton. Return: (Auckland), (Wellington), Lyttelton, Tauranga, South Philippines, Manila, (Kaohsiung), (Hong Kong). Manila, Keelung, Kaohsiung, Hong Kong, Fiji. Return: Fiji, Tauranga, Manila, (Keelung), (Hong Kong). Sailings South Africa-Australia and v.v.
. Cape Town, Port Elizabeth, Durban, Melbourne, Sydney, Adelaide, Fremantle. Return: (Melbourne), (Sydney), (Adelaide), Fremantle, Mauritius, Cape Town, (Port Elizabeth), (Durban). Jakarta, Singapore, Penang, Port Kelang, Brisbane, Sydney, Melbourne, Burnie (ANRO Australia only), Adelaide, Fremantle. Return: (Brisbane), (Sydney), (Melbourne), (Burnie) (ANRO Australia only), (Adelaide), Fremantle, Jakarta, (Singapore), (Penang), (Port Kelang). 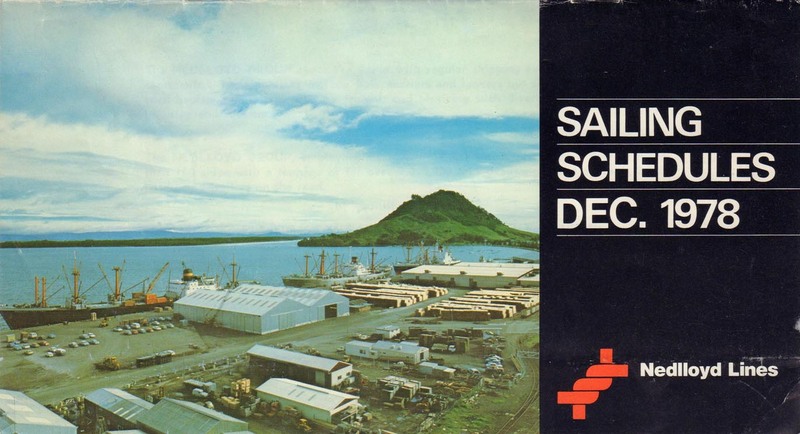 Click to view a cavalcade of sailing schedules from 1979 to 1983. See the archives section for more brochures of Nedlloyd Lines. See also the shipping in 1971 section. Please also respect the copyright provisions as given below. may not be used without prior permission from its owner. This page last updated January 26, 2017.